230 pages | 26 B/W Illus. While the potential of stem cells is recognized, their proliferation and differentiation must be more precisely controlled to maximize the production of therapeutically relevant cells and for cell replacement therapies to minimize contamination with residual cells that can give rise to side effects. How can engineers make contributions to address these challenges? With contributions from pioneers and experts, Stem Cell Engineering: Principles and Practices highlights recent advances in the understanding of the cellular and molecular composition of the stem cell niche, as well as approaches to build upon this basic information to direct stem cell differentiation into therapeutically valuable lineages. The growing recognition of stem cells as an important and exciting field will continue to draw investigators with diverse backgrounds—from biology, engineering, and the physical sciences—and thereby enable further progress in these and other new directions. 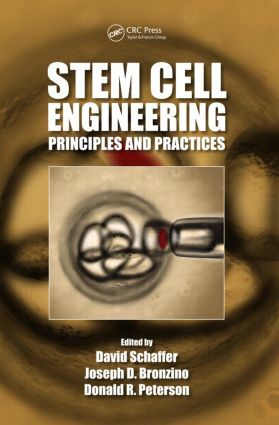 This book discusses advances made during the last decade that have led to increasingly defined culture systems for growing stem cells, starting from co-culture with feeder cells in the presence of serum to growth on synthetic substrates in defined medium. In addition to highlighting many recent advances, it underscores the need for future work.